‘Tis the season for research reports from Wall Street economists looking ahead to 2017. And as you can imagine, the surprise victory of Donald Trump dominates most of these pages, which are filled with estimates of the impact of the president-elect’s fiscal plans on GDP growth, inflation and share prices. Unlike most, I go straight for the "tail risk" what-ifs to get an idea of what is in the realm of possibility. If there is any lesson from 2016 as we look ahead to the new year, it's that political uncertainty and popular anger have ushered in an era of instability and black swan events. We had Brexit and the Trump win. Fresh elections in Europe are coming next. Yet one of the biggest black swans out there is the other half of Trump's political platform: A pledge to renegotiate America's trade deals, especially those with China, possibly inciting an outright trade war. More than a few eyebrows have been raised by Trump's aggressive post-election behavior toward Beijing, first by his acceptance of a call from Taiwan's president and his suggestion that he may abandon the One China principle, and second by his Twitter comments in the wake of China's seizure of a U.S. Navy underwater drone. The prospects of a standoff with China are likely higher now that Trump’s has appointed "Death by China" author and Harvard-trained economist Peter Navarro to head a newly created National Trade Council within the White House. The Trump transition team said the NTC would lead a "Buy American, Hire American" program that would boost job creation with a focus on infrastructure and defense. "The new administration should bear in mind that with economic and trade ties between the world's two largest economies now the closest they have ever been, any move to damage the win-win relationship will only result in a loss for both sides," China’s official English-language newspaper said in an editorial Friday. Of course, Trump or some of his supporters might not see the current relationship as win-win. So just what would Trump’s proposals mean for that relationship, and for the U.S. economy? Deutsche Bank researchers recently looked at a possible "border tax adjustment" proposal put forward by House Speaker Paul Ryan and congressional Republicans and supported by Trump. Basically, the proposal would tax imports, reduce taxes and exports and be tantamount to a one-time competitive devaluation of the U.S. dollar — the type of strategy that Trump has accused China of abusing for years. Deutsche Bank estimates it would boost U.S. trade competitiveness by 15 percent instantly as imports would become 20 percent more expensive while exports would be 12 percent cheaper after taking the tax changes into account. In their view, this would be enough to almost completely close the U.S. trade deficit. A border tax would likely boost inflation by increasing the cost of everyday items imported from China and elsewhere. Retailers and producers would be in a lurch: Either pass the costs onto consumers or allow profitability to be pinched. Higher inflation would encourage more rapid Federal Reserve interest rate hikes. China would be angered. Not only would higher inflation and higher interest rates continue to strengthen the dollar — which would increase the cost of trillions in off-shore dollar-based emerging market loans — but a drop in export activity would weaken an already vulnerable Chinese economy trying to extricate itself from a bad debt problem. Still, there is hope that thanks to China's slow reduction in its reliance on the U.S. economy, Beijing will resist the urge to retaliate and instead focus on reducing factory oversupply in areas like steel and textiles in an effort to reorient its economy toward Chinese consumers and the production of higher quality, higher priced goods. 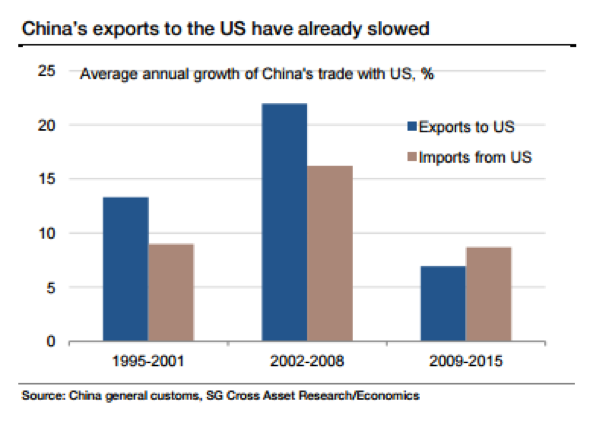 As things stand now, less than 4 percent of China's GDP depends on the United States, according to Societe Generale. On the other hand, China may choose to retaliate and more firmly establish its place in the global economy. The Global Times, which Reuters describes as “an influential tabloid published by the ruling Communist Party's official People's Daily,” responded to the choice of Navarro with an editorial that said, in part: "China is powerful enough to withstand pressures from the Trump government. Beijing will get used to the tensions between the two countries. If Washington dares to provoke China over its core interests, Beijing won't fear setting up a showdown with the U.S., pressuring the latter to pay respect to China." That’s a tail risk to watch for as we enter 2017.